Vinyl LP + Download + bonus track, “Čuoika”. All downloads are 24 bit recordings by Chris Watson. Yoiking is the ancient chanting practise of the Sámi People – the indigenous peoples on the top of Europe. Yoiking originates from time immemorial – legend tells that it was the faires and elves of the arctic lands that gave yoiks to the Sámi People. Yoiking was an important element of the religious rituals in pre-christian times and has survived both christianity, imperialism and the fact that Sámi areas were confiscated by the states of the north; Norway, Finland, Sweden and Russia. 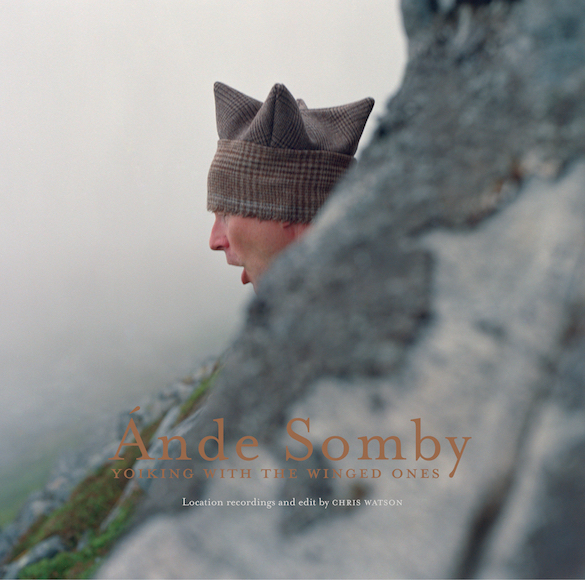 Ánde Somby is deeply rooted into the yoik tradition. He comes from the eastern part of the north Sámi areas and in the tundra tradition of the reindeer herders and from the valley tradition of arctic farmers. His yoiking is both quite technical as well as melodic – Somby is at the same time an innovative yoiker. All the three pieces on side A are his compositions. His signature as a yoiker is an expressive style performed on the borders of the human voice. The recordings are made by Chris Watson, the world famous sound artist and leading field recorder. 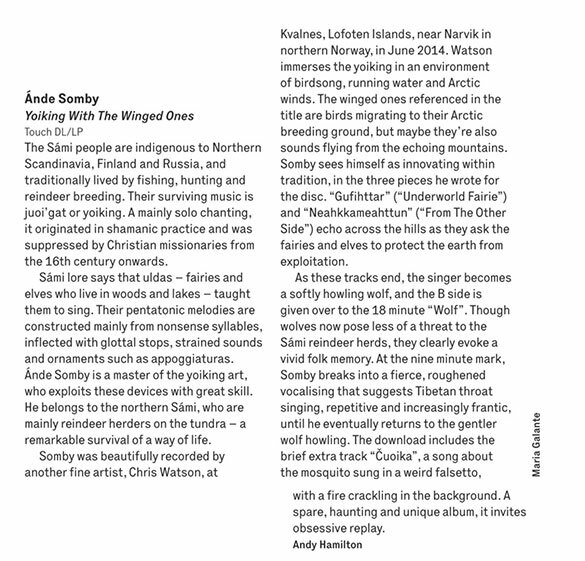 The recordings took place in Kvalnes, Lofoten mid June in 2014 in a moment while the arctic winds had a little rest. Chris Watson has also done the post production. A K Dolven took the photos for the project and has been instrumental in developing the concept. Thanks also to Tony Myatt. Sometime in late November last year I switched on BBC radio late one evening to be blown away by the raw, powerful voice of a yoiker – one who sings the Sámi peoples’ singing/chanting traditional that aims to form spiritual connections between people and nature. In addition, you could make out the outdoor sounds of wind and birds. It was spellbinding to say the least. Anyway, the live recording was issued early this year on vinyl and you get sent the digital file format, if you buy directly from the record company. The recordings were made in 2014 in the Lofoten area of Nordland, Norway by BBC sound recordist Chris Watson; the yoiker is Ánde Somby, whom I believe is also a professional lawyer. The echo effects hint that it was recorded in a hilly, rocky area. Such is the power of Ánde’s voice – he really does give it some welly – that it eventually falters under exhaustion towards the end of the record, which just under 40 minutes in total.